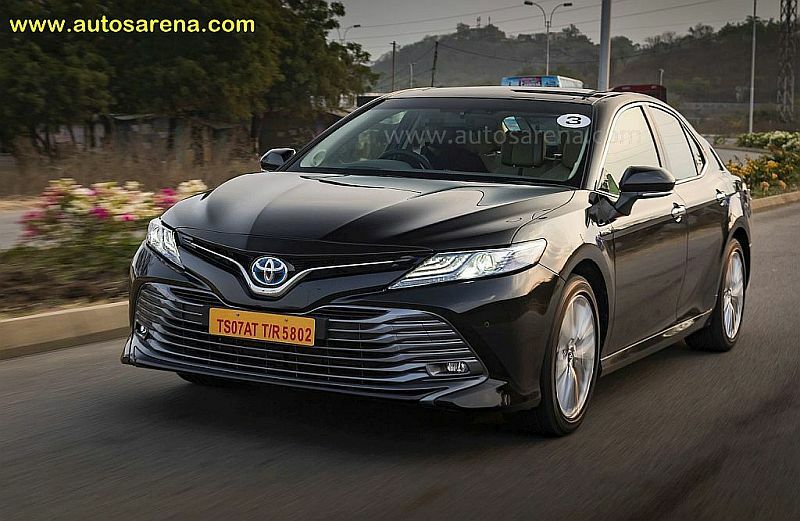 The name Camry comes from the Japanese word Kanmuri meaning Crown and it indeed is one, at-least in TKM’s portfolio in India. 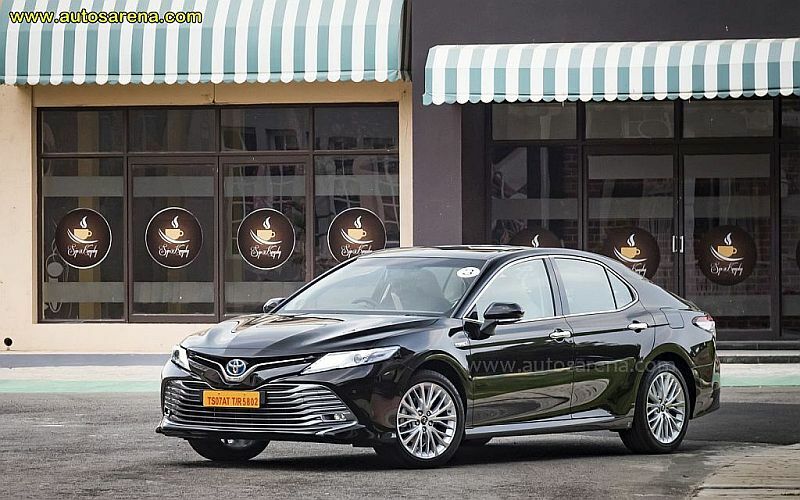 While the Camry nameplate arrived here in the year 2002, it had made an international debut way back in the year 1982 and still continues to be one of the top selling sedans across the globe. 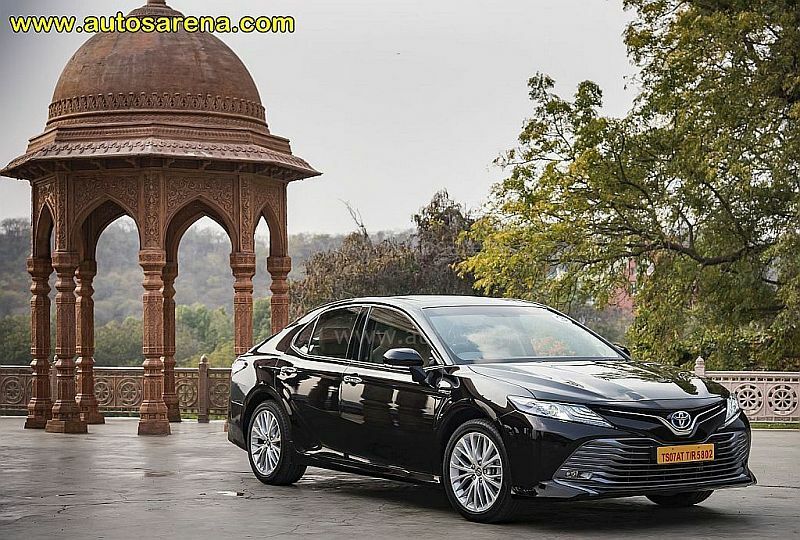 Toyota Kirloskar Motor (TKM) recently launched the 8th generation Camry in India which is based on the TNGA platform that is also seen in the new Prius, C-HR Crossover and the Lexus ES 300h. 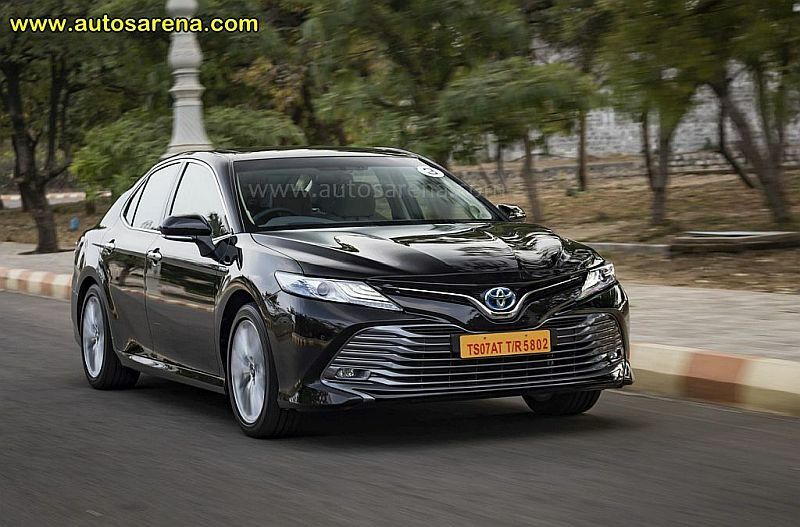 Gauging a positive sentiment for Hybrid & electric vehicles, TKM decided to go only-hybrid with the 8th generation Camry in India. While Hybrids are more expensive than conventional combustion engines, they are seen as the future of mobility as air-pollution and environmental damage are a big threat to the globe we are living in. 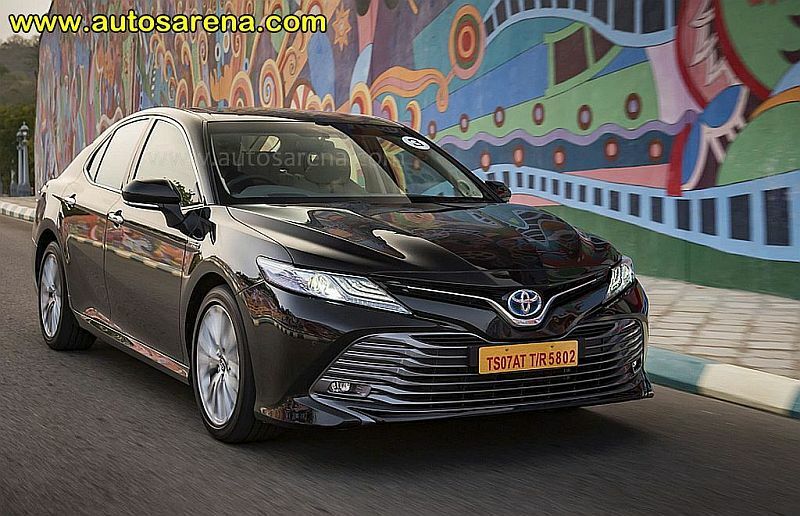 One glimpse of the all-new Camry Hybrid and you are bound to appreciate how the car has evolved over its previous avatar. The new car is not only longer and wider, but also has a lowered stance. There is no denial that the new car is inspired by its more expensive Lexus cousin. 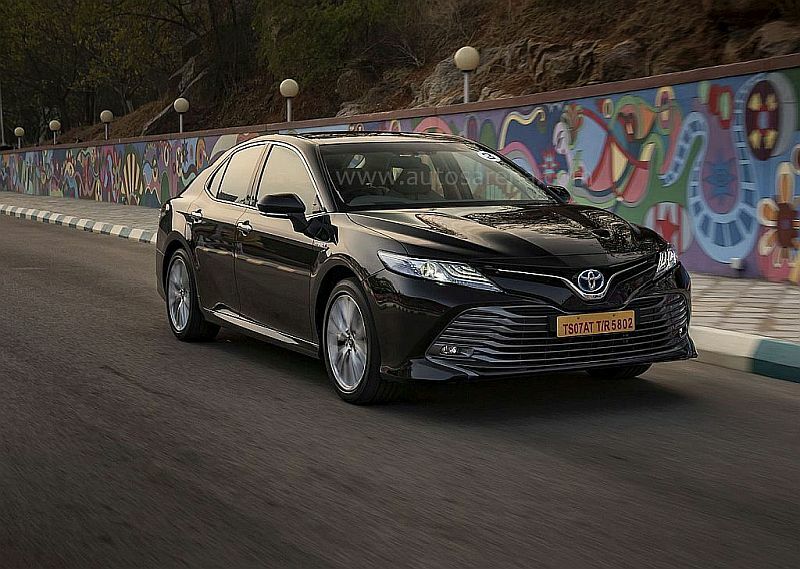 The chrome lined grille, the sweptback LED headlamps with integrated LED DRLs and the undersized fog lamps give the Camry a sharper look. 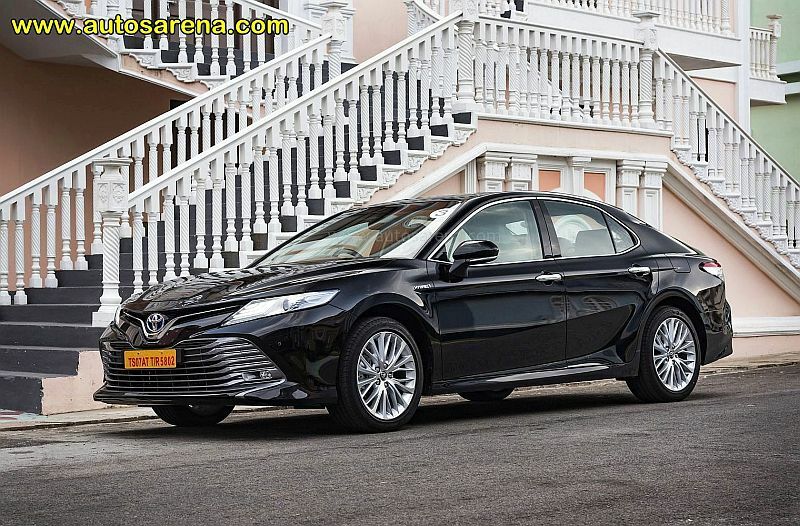 The plus size grille may not be to everyone’s liking but it definitely lends the Camry an imposing personality. The Toyota logo with the blue circle indicates that this is a Hybrid sedan. When viewed in profile, the Camry looks much longer and curvaceous as compared to the outgoing model. The long and lowered stance gives it a stately appeal, especially in darker shades of paint. 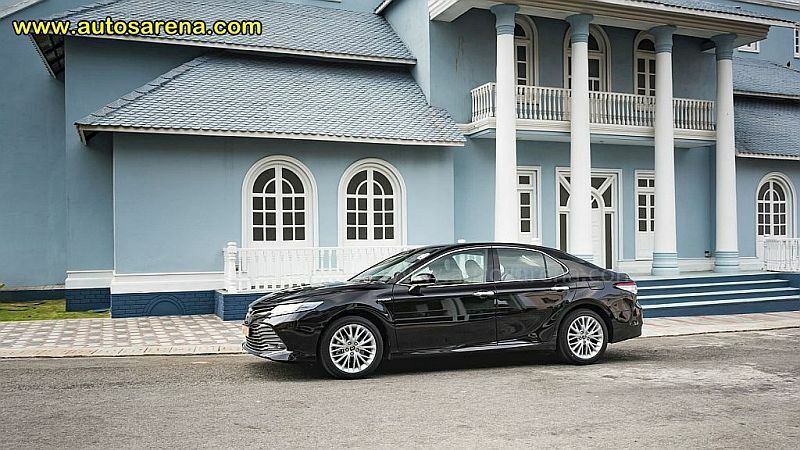 The multi-spoke alloy wheels look elegant and compliment the overall design of the car. 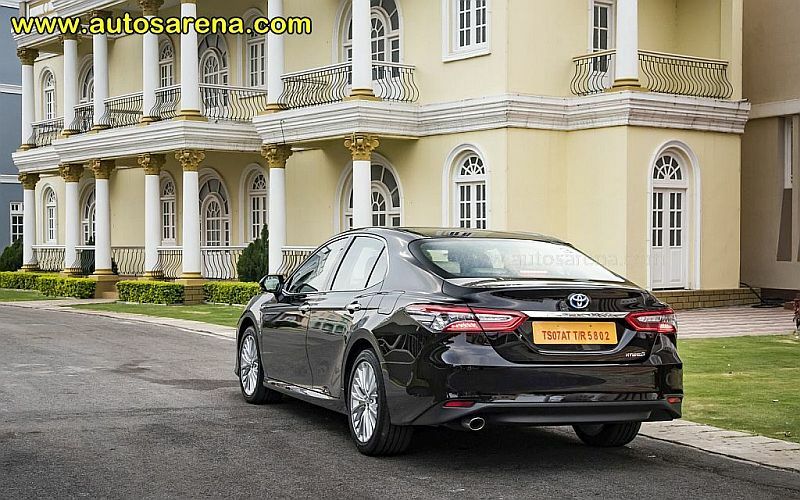 The new Camry sports slimmer A pillars with the wing mirrors moving down to the doors. This is not only a styling touch, but also helps immensely to cut down blind spots while driving. The C pillar is now extra-large with the roof extending towards the cargo zone, thus freeing up considerable headroom for rear seat passengers. 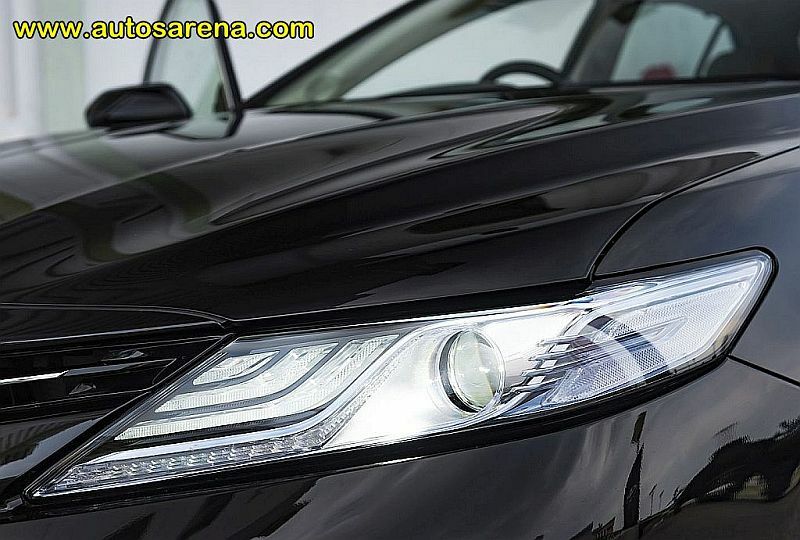 The all-LED wraparound tail-lamp cluster appears modern and the name Camry engraved on the chrome appliqué looks classy. While this model gets a single exhaust pipe, having chrome tipped exhaust pipes on either sides would have looked grander. The moment you step inside the cabin, there is constant feel-good factor all around. 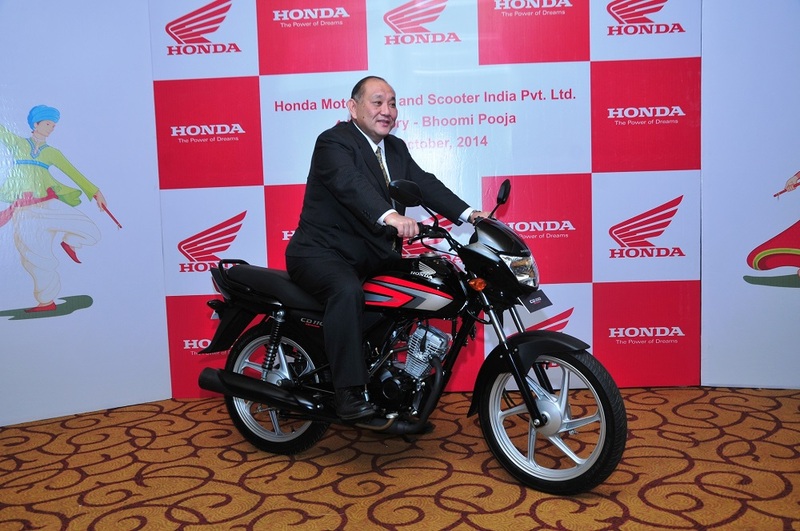 Firstly, the quality levels have gone up significantly and so are the luxuries and gadgetry. The light coloured cabin looks and feels premium with a generous dose of goodies to pamper its occupants. Thanks to a new platform, the cabin is now larger and wider than before. 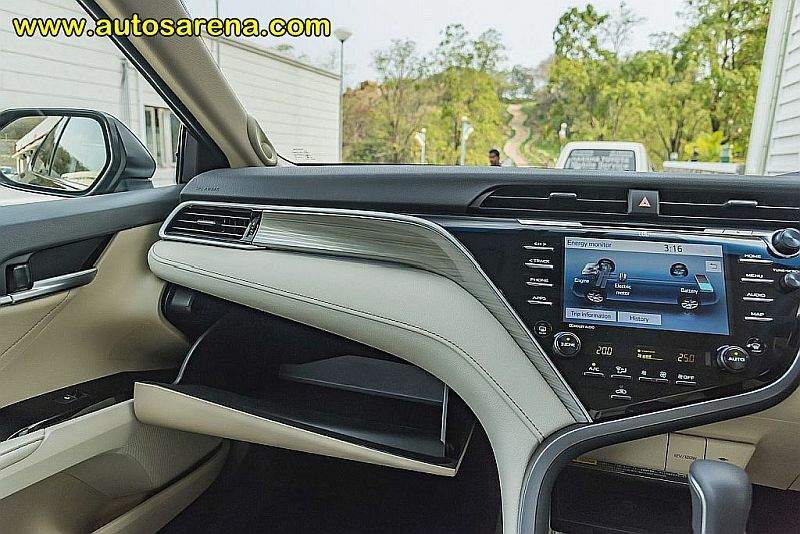 However, we had a feeling that vertical space has decreased in the cabin which could be due to the vehicle’s lowered stance and installation of an electric sunroof. From the driver’s seat, the view is excellent and ergonomics are spot-on. 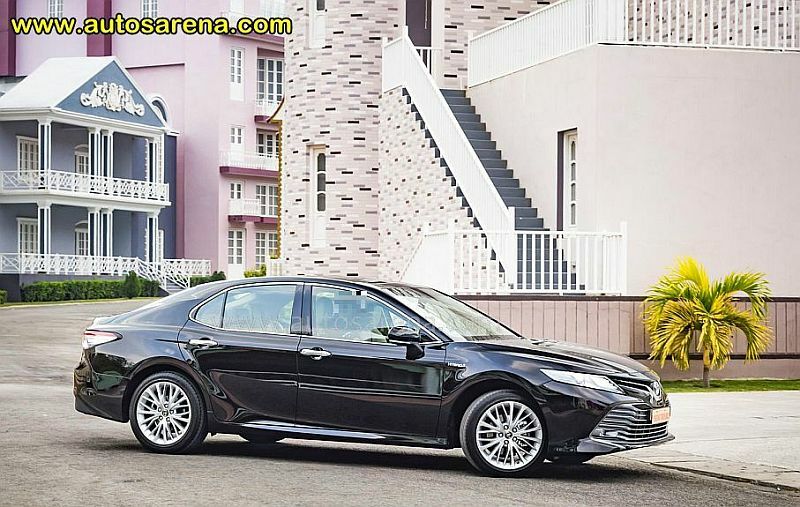 Toyota has taken a lot of effort to make the Camry a driver focussed car though many would still prefer the luxury of resting comfortably in the rear seats while being chauffeured around. 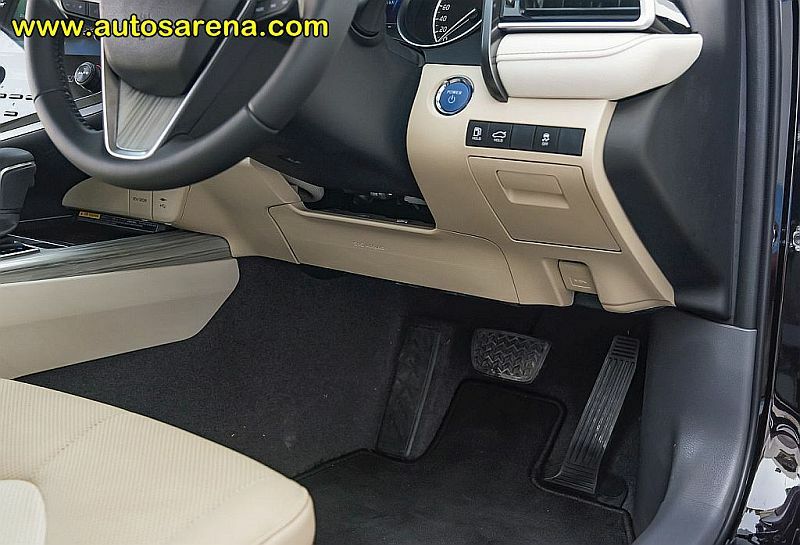 The front seats are electrically adjustable and so are the wing mirrors and steering wheel. 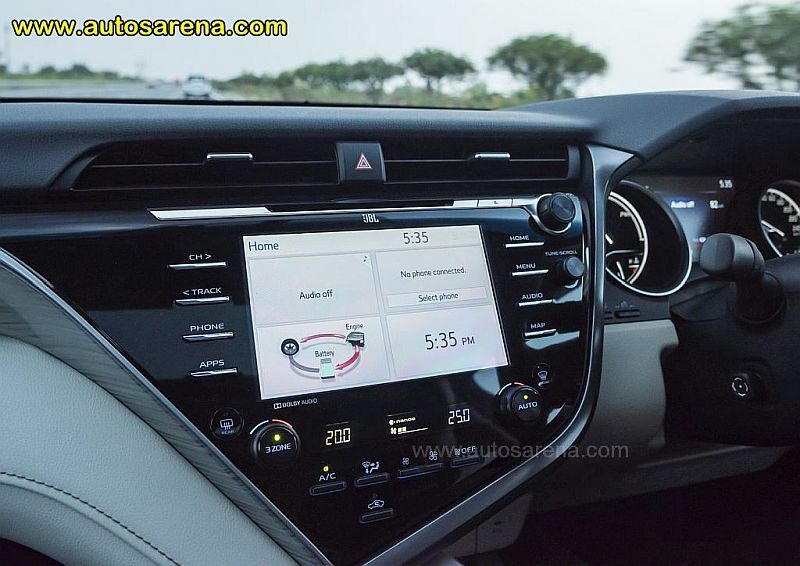 The new Camry boasts of a 10 inch head-up display, 7 inch MID and an 8 inch infotainment unit which does-not include Android Auto and Apple Carplay integration, the omission of which is more for the security purpose than anything else. The car also gets a 9 speaker audio unit from JBL with Clari-Fi technology which sounds great and is as per segment standards. 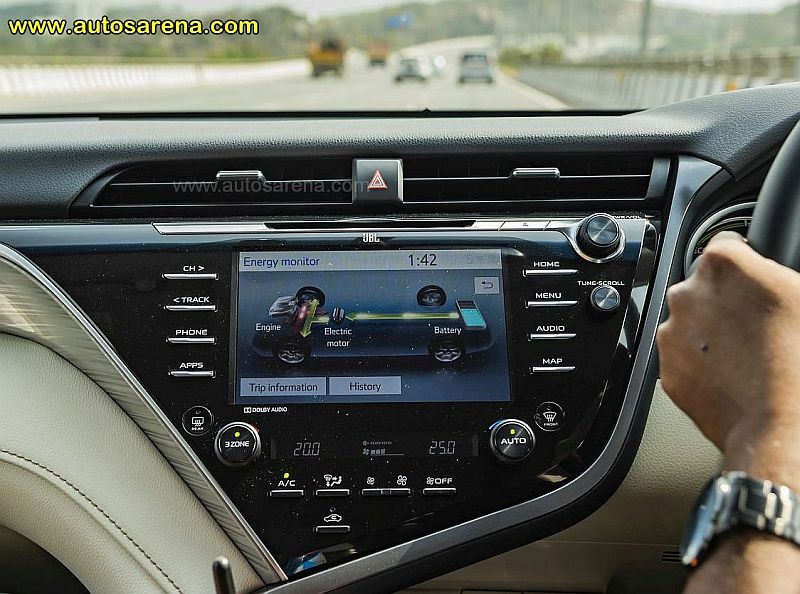 As mentioned earlier the driver seat is 10 way electrically adjustable and also comes with memory function. While the front seats are ventilated for added comfort, the rear seats get a recline feature which can be controlled through a touchpad on the rear arm rest. 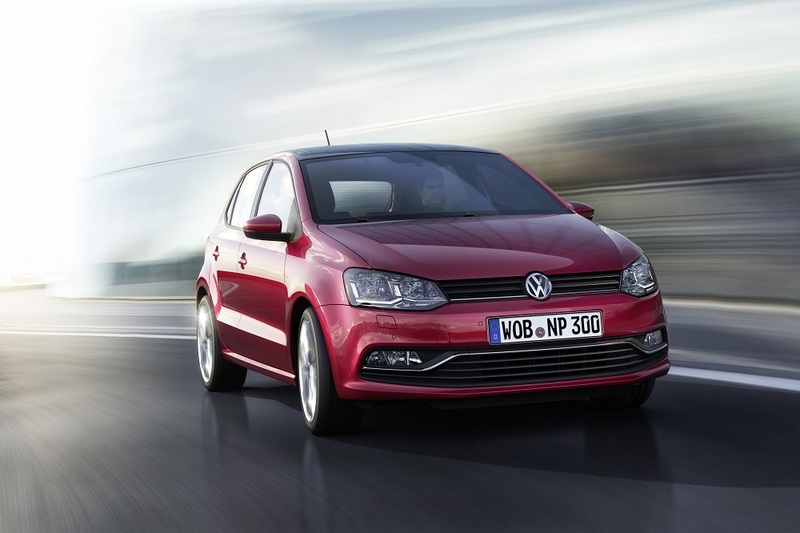 Other features that can be controlled via the touch pad are the music system, air-conditioning and rear sunshade. The seats in general are very supportive, cushioning is perfect and the leather feels supple and comforting. While it is not the largest cabin in its class, you won’t have any reason to complain about knee room or headroom at the rear. 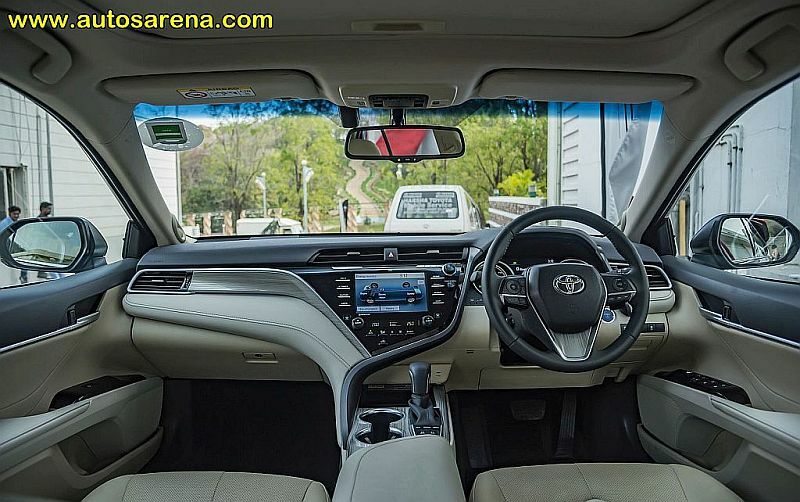 Spending hours inside the Camry will not cause any discomfort, thanks to the supremely comfortable seats, light coloured cabin and a large glass area which includes the sunroof. 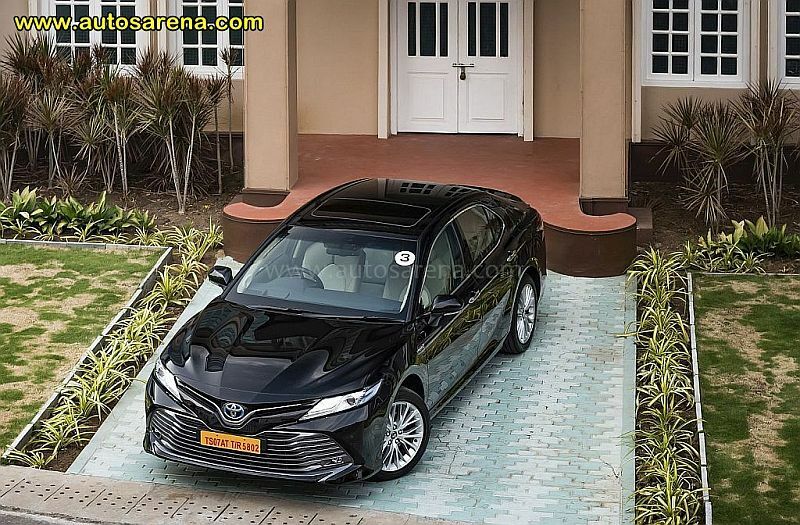 The 2019 Camry hybrid has a 2.5 litre Atkinson cycle petrol engine paired with an electric motor which together produces a respectable 215PS of power. 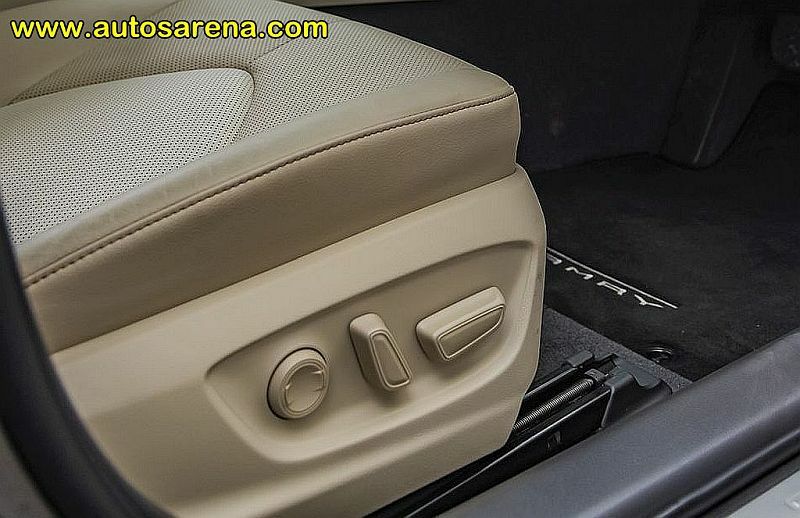 It also gets the 4th generation Hybrid technology and the battery pack has now been re-positioned under the rear seat, thus freeing up considerable boot space. Toyota also claims that fuel efficiency has improved by nearly 20 percent. 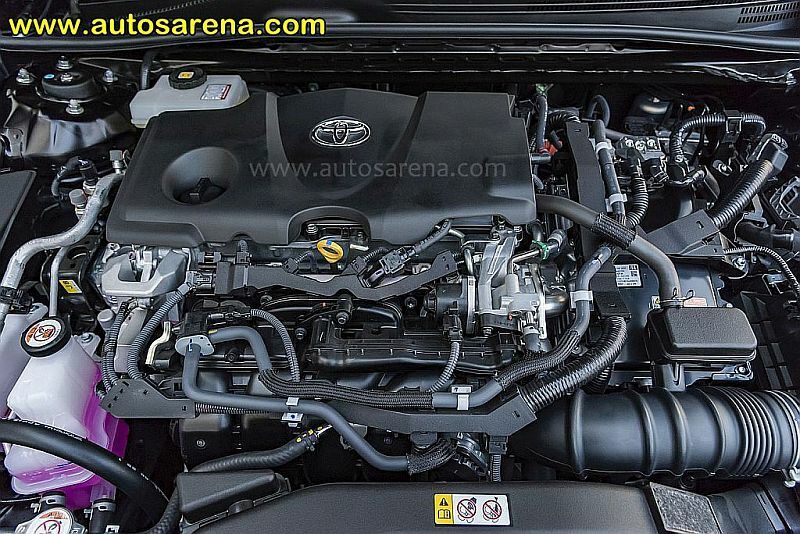 While the outgoing model was good in every aspect, Toyota engineers have worked really hard to match up to Lexus levels when it comes to cabin quality and refinement of the engine. 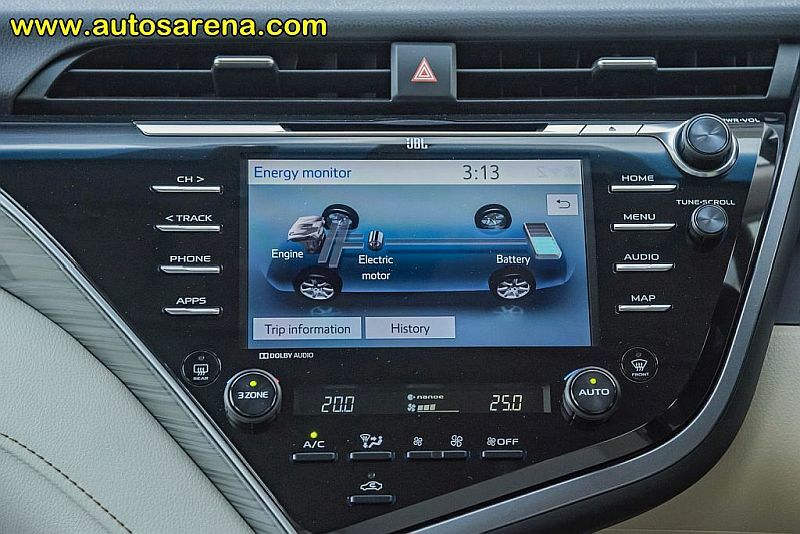 As with other Hybrids, the Camry too starts on pure EV mode so expect pin-drop silence when the Camry is ready to start off. 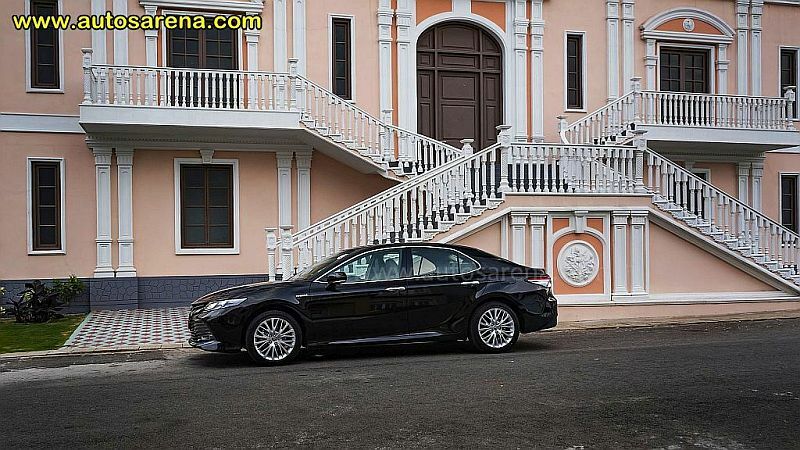 The entire driving experience is silky smooth and the Camry impresses with its refinement. 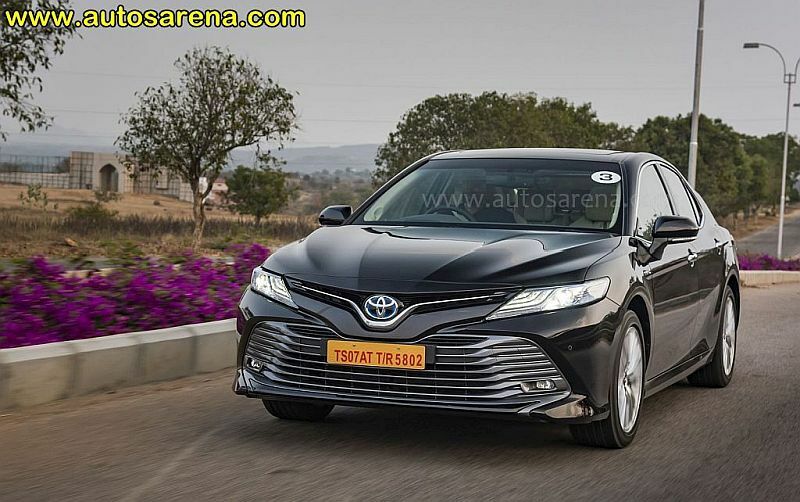 While there is no sudden burst of power, the Camry is brisk to cross the 3 digit mark and keeps building up pace without any strain on the engine. 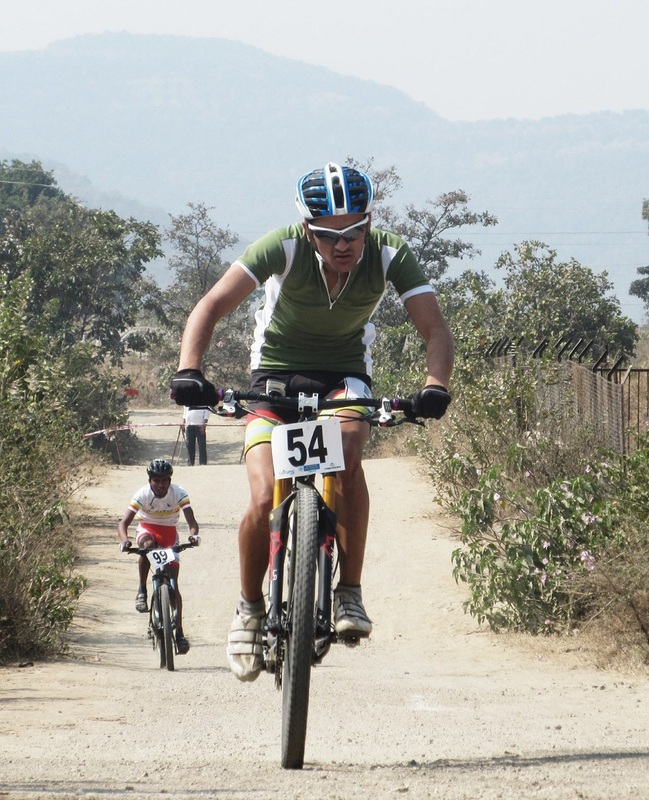 The petrol and electric motor work in perfect sync. The transition from petrol to electric and vice-versa is seamless and often goes unnoticed by the driver. 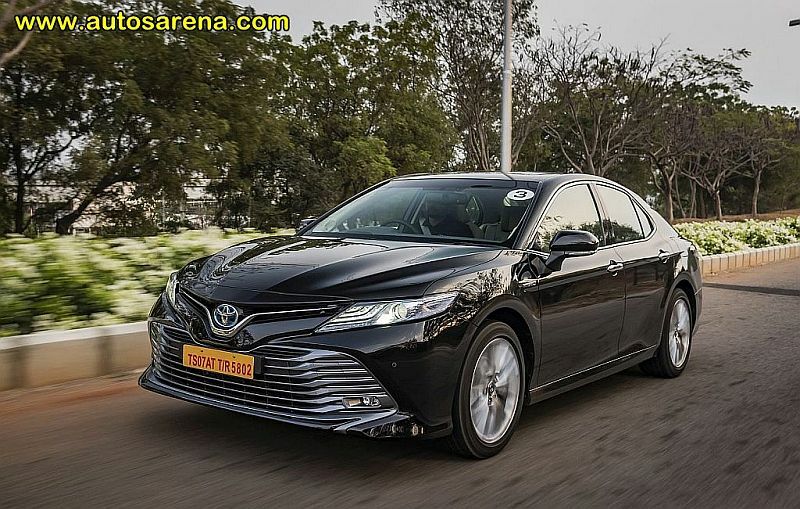 To ensure that the driver does not encounter any blind spots, the Camry now gets slimmer A pillars along with relocation of wing mirrors onto the doors. Also aiding the unhindered view is the lowered dashboard and cowl. The driver’s seat is a very comfortable place to be in with all knobs, switches and buttons within easy reach. 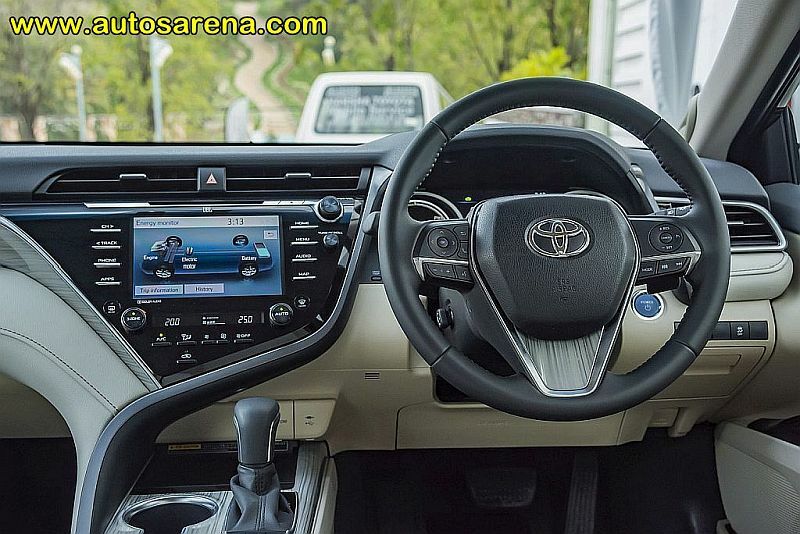 The MID displays a host of information and the steering wheel gets controls for audio, cruise control, MID and telephony. 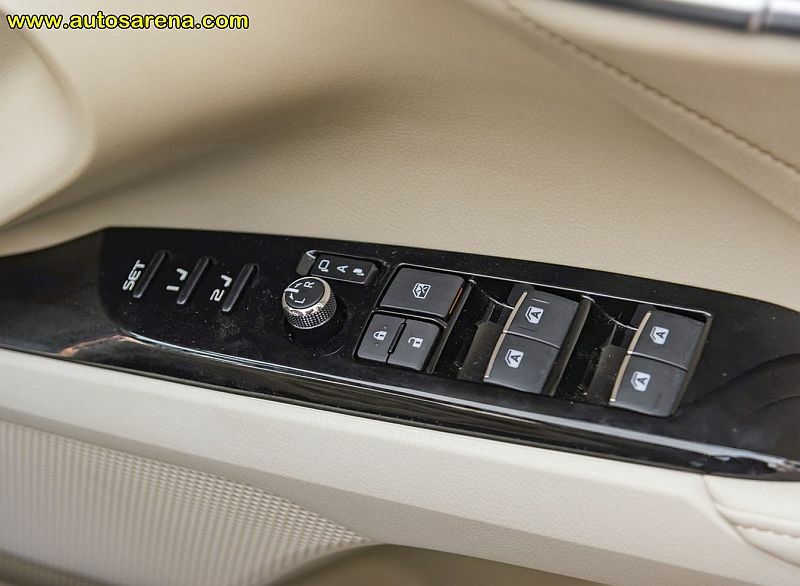 The 7 speed eCVT gearbox may not be the quickest but does the job pretty effectively. NVH levels are kept in control and its only when you floor the accelerator that the engine sound gets audible in an otherwise silent cabin. 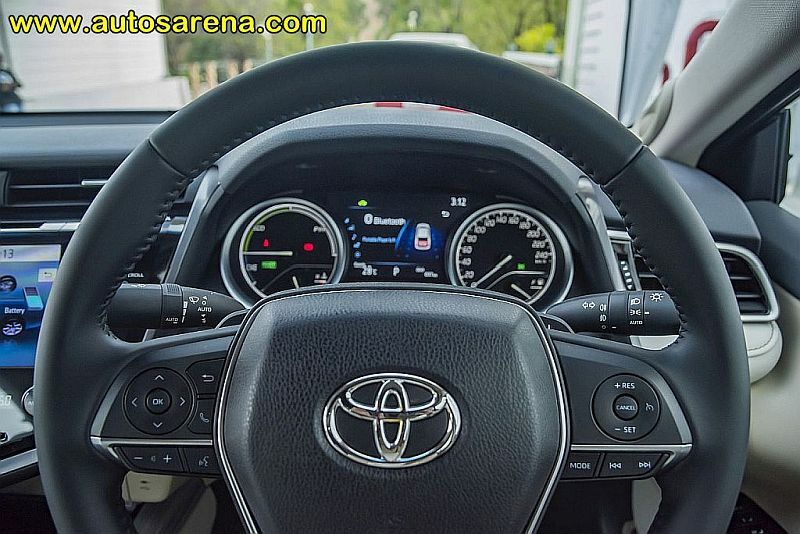 The Camry comes with three driving modes – Eco, Normal & Sport. 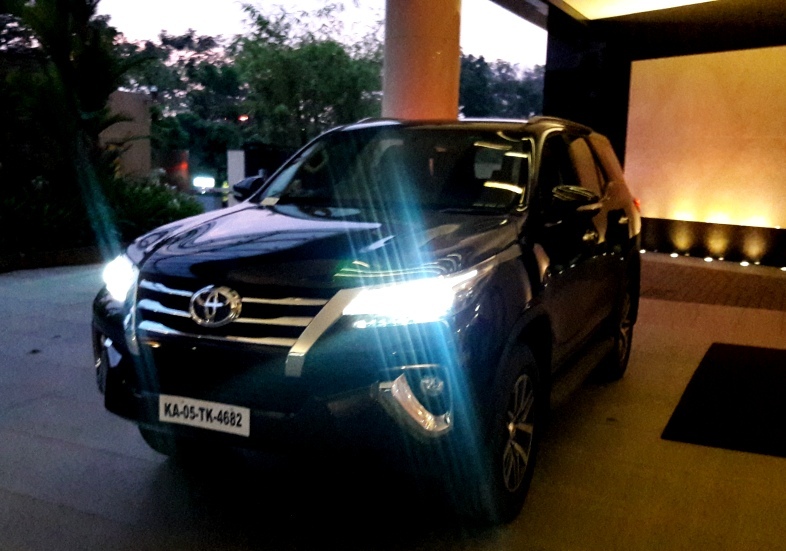 It was the Sport mode that kept us happy during our daylong drive. Not that the car transforms into a rocket, but yes, the engine feels punchier and the steering response gets sharper. 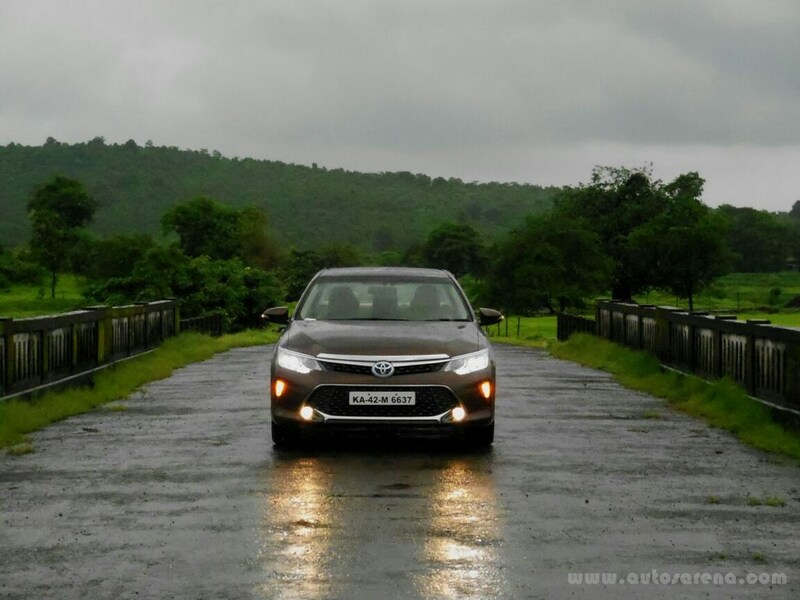 Surprisingly, even in Sports mode, the car averaged close to 16kmpl which is commendable for a car from this segment. The suspension is tuned to offer a plush ride. 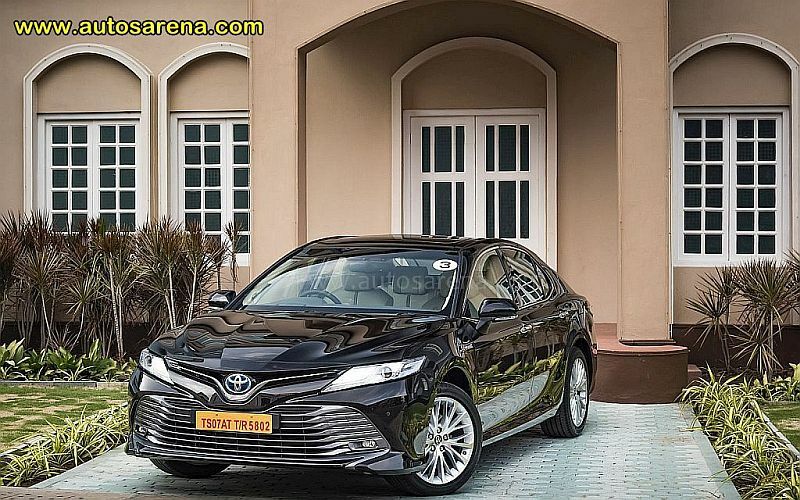 While at the front the Camry gets McPherson struts, the rear features an independent wishbone suspension set-up resulting in a very comfortable and flat ride. Straight line stability is excellent and the Camry also surprised us with its grip and rigid chassis while taking corners. 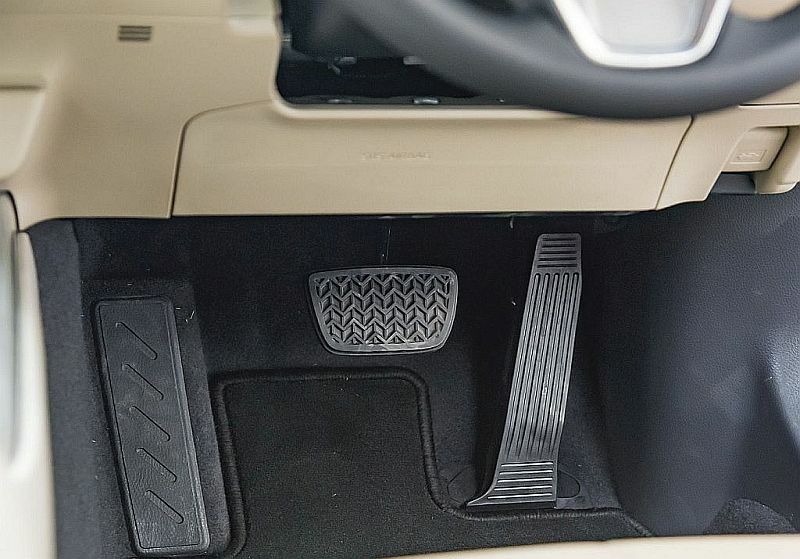 The car doesn’t lose composure over rough patches or potholes even at high speeds; it simply glides over without causing any discomfort to the occupants inside. High speed braking is spot-on but the brakes have a sharp bite at slower speeds, something that needs getting used to. 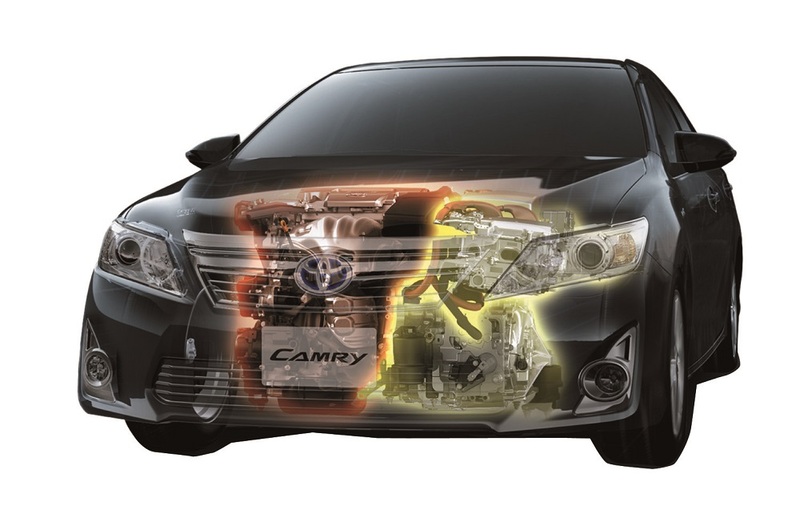 The Camry gets a comprehensive Safety pack with 9 airbags, ABS with EBD and brake assist, vehicle stability control, traction control, front and rear proximity sensors and an electronic parking brake. 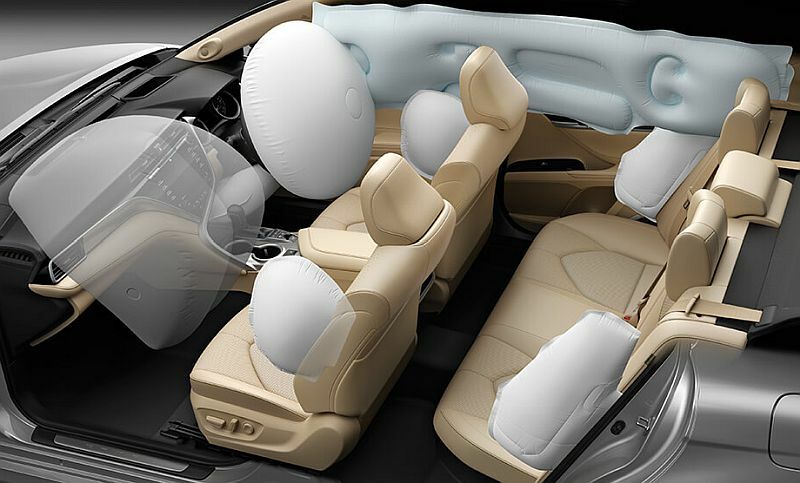 However, in some other developed markets the safety kit also includes pre-collision warning system, blind spot detection, intelligent radar cruise control, lane departure warning with steering assist, surround-view camera, etc. 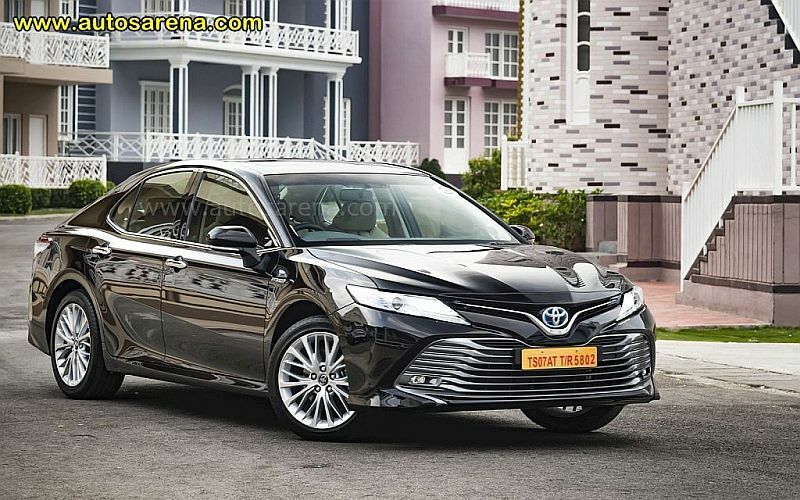 In totality the Camry Hybrid is a stylish, refined and well-mannered luxury sedan that not only scores high on performance, comfort and fuel efficiency, but also pollutes much lesser than other conventional vehicles. 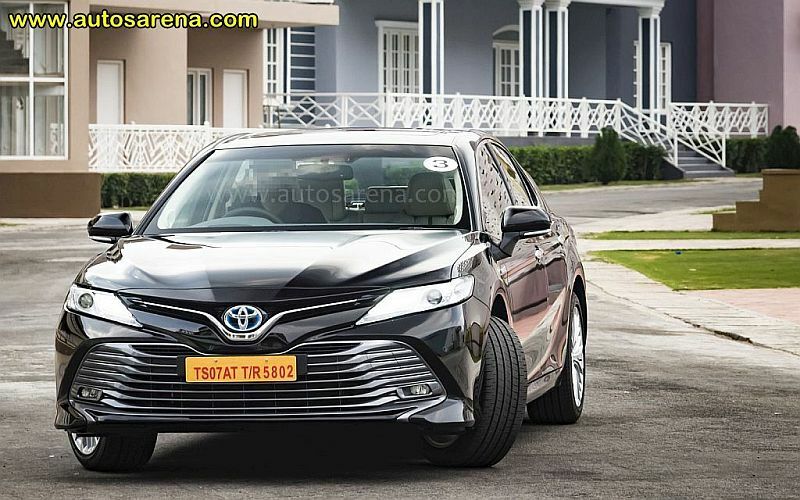 Some may try to pitch Camry Hybrid against the VWs and Skodas, but Toyota beats these brands hands down when it comes to the real world ownership experience. The only real contender to Camry Hybrid is the Honda Accord Hybrid. 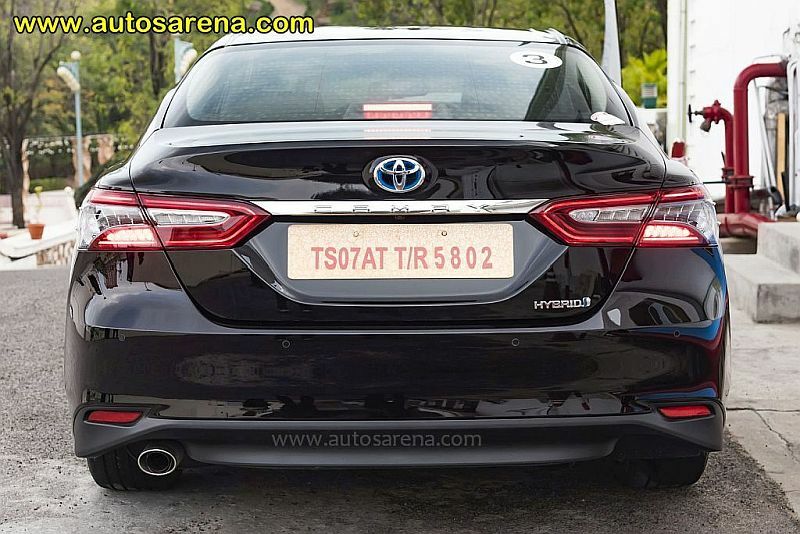 And while both Toyota and Honda are known for their finely engineered cars with top-notch reliability, the Accord is dearer by a whopping Rs.6 lakhs. 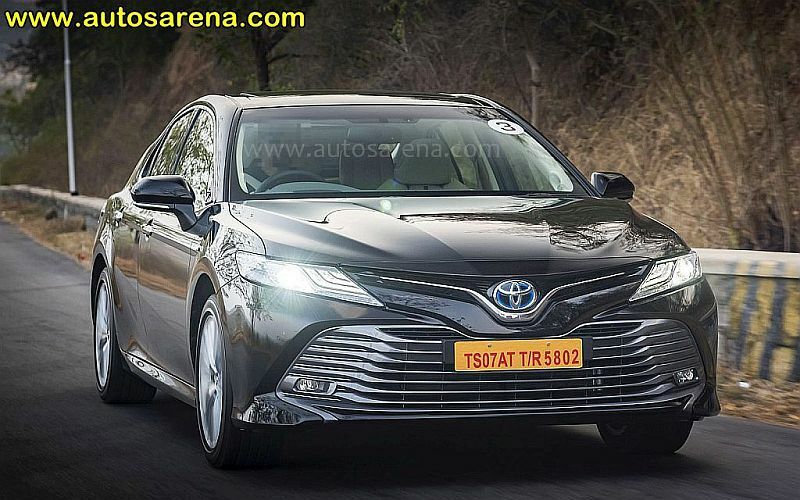 At 36.95 lakhs (ex-showroom) for the Camry Hybrid, the Toyota badge does not disappoint while the Camry nameplate promises to offer you more than what you paid for.